The estate has been in the family for three generations. Since 1992, it has been run by Bernard Bouvier. Henri Bouvier, Bernard’s grandfather, created the estate in 1910. 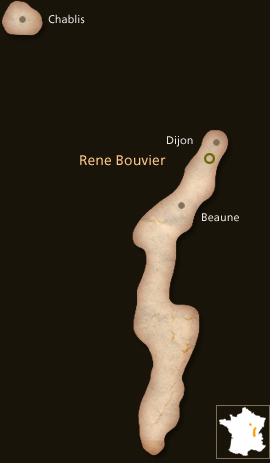 Henri’s son, René Bouvier, took over in 1950, and extended the estate to an area of 29.65 acres (i.e. 12 hectares) by 1991. The family owns vineyards in six villages, from Gevrey-Chambertin in the south to Dijon in the north. The 18 appellations extend over an overall area of 42 acres (i.e. 17 hectares), and include Bourgogne, Côte de Nuits Village, Gevrey-Chambertin Village, Fixin Village and Marsannay Village, Gevrey-Chambertin Premier Cru and Grand Cru. The classic Burgundy grapes are grown here: Pinot Noir for the red wines and the Marsannay Rosé, with Chardonnay and Aligoté for the white wines. The estate is fortunate enough to possess vines which are an average of 50 years old; some of the Gevrey-Chambertin plots have vines which are over 80 years old. dynamic principles and everything has been designed with the greatest respect for both grapes and wine. by Pinot Noir and Chardonnay grapes, is the hallmark of quality. The quest for purity of expression, well-balanced wine, and minerality, highlighting the unique nature of each “climat” (plot of vines) guides each action in the pursuit of perfection from the vineyard to the wine-cellar. The purity and equilibrium of the wine are achieved by harvesting the grapes at the right stage of physiological and phenolic ripeness, neither too late, nor too early, depending on the “climat”. Patience and careful observation lead to less intervention, allowing the terroir to express its individuality without unnatural forcing, which would endanger the balance of the wine. Growing high quality grapes, the foundation of a pure and well-balanced wine, is a labour intensive process. Careful vineyard management is necessary to respect the soil, in order to preserve environmental harmony and biodiversity. “We practice ecological wine-growing, vigilant and precise, respectful of soil and plants (microbial life and auxiliary fauna).” The domain is working to obtain organic agriculture certification. Both Guyot and single cordon pruning are used in the vineyards. The rule at the estate is to control production for optimal ripeness, by limiting each vine to 8 bunches of grapes. Production can vary slightly from one vintage to another. On average, the appellation Bourgogne produces 5.35 gal/acre (i.e. 50 hl/ha), the appellation Village 3.74 gal/ acre (i.e. 35 hl/ha), the “Premiers Crus” and the “Grands Crus” about 3.21 gal/acre (i.e. 30hl/ha). The harvest is a key moment of the year on the estate. The grapes are hand-picked and collected in 20 kg boxes, so as not to squash the bunches and damage the grapes. The grape-pickers select the grapes very carefully as they harvest them. When the grapes reach the winery, they are placed on a vibrating table to eliminate small impurities. They are then transferred to a sorting table to be handpicked, thus retaining only the highest quality grapes. This drastic selection procedure ensures excellent wine even for bad vintages, when excess humidity favours the development of diseases or when lack of sunlight prevents optimal ripeness for some grapes. After destemming, the selected grapes fall into a container, which is emptied by gravity into the vat. The care taken when handling the grapes avoids the release of herbaceous tannins, allowing only the silky, rounded tannins to develop in the wine. each appellation. Red wine matures in a specific cellar, with a suitable temperature and hygrometry, for 16 to 18 months. After pneumatic pressing of whole bunches of grapes, the two fermentations (alcoholic and malolactic) occur in oak barrels. White wines mature in oak barrels in a specially designed cellar for about 16 months. Vinification now takes place in 600 litre barrels, which were first used for the 2008 harvest. The terroir can only express itself in the glass if the vine has been allowed to absorb the specificity of the “climat”. The originality of each wine reflects the features of the vineyard plot: altitude, exposure, slope, soil and bedrock, together with the specific climatic conditions, sometimes due to subtle changes in the landscape, that have nourished the grapes and the vine. The constant regularity with which, from vintage to vintage, each “climat” affirms its identity, its individuality and its originality is merely guided by the winegrower, whose personality must not be allowed to swamp the character of the wine. The identity of a “terroir wine” expresses itself mainly through the sapidity or uniquely original taste of each wine. Geo-sensorial gourmet tasting encompasses all the classical terms used in sensory analysis, but with a more complete approach in the mouth, the most suited to the conception of wine at this estate. The tactile dimension of wine, or “mouth feel”, fully reveals consistency, suppleness, viscosity, texture, vividness, minerality, length and ability to age successfully. As Jacky Rigaux writes: “Together with the frank sensation of viscosity generated on the palate by a “terroir wine”, the suppleness and consistency, associated with natural elegant vivacity, reveal all the dimensions of wine texture. A “terroir wine”, whether white or red, must have a mouth feel which evokes silk, taffeta and velvet… From their time in the barrel and their earliest youth in the bottle, the great “climats” […] have always exemplified a matchless texture. Thus the length of the wine, which stems from of all these qualities harmoniously united, will reveal the subtle aromas of the “climat” as well as its original mineral touch. This white wine is a flattering pale gold color with pronounced green tints. The dashing, fruity nose recalls Reinette apples. The attack is frank and vivid, supported by a well – chiseled consistency. This mouth – watering wine shows great minerality. The Aligoté grape combines with the terroirs of Marsannay and Gevrey to give a wine that is both generous and lively, a very original, self-assured version of Burgundy’s second white grape variety. 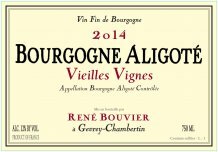 Aligoté is a medium-fine grape variety, which is very ancient in Burgundy, as it has been known here since the 17th century. The regional AOC Appellation Bourgogne Aligoté was established in 1937. Most of the Bourgogne Aligoté comes from the Le Chapitre plot in Marsannay. The Comblanchien limestone, which lies above the vineyard, has a favorable effect on the soil. The former limestone cliffs that used to face east, underwent extreme fragmentation during the last ice age twenty thousand years ago, resulting in gravel chips measuring from one to two centimeters in size, which accumulated downslope. This limestone scree (called “grèzes litées” in Burgundy) generates an excellent soil for growing vines, with good drainage, like that of the Clos du Roy. In such a soil, the Aligoté grape can fully express all its aromas and subtleness. Vineyards with Aligoté grapes are located in both Marsannay and Gevrey-Chambertin. Grapes are pressed in whole bunches. Maturation for 12 months in vats to preserve freshness and fruit. Ideal as an aperitif, it will also go well with poached fish and a reduction, shellfish with tangy limes, country-style paté, Burgundy’s traditional parsley ham and snails, and all forms of persillade in general. Best served at 14 ° C.
This red wine is clad in a beautiful, eye-catching ruby. The dashing nose with good intensity, explores the whole range of fresh fruit. On the palate, the attack is fresh, and develops with a good mouthfeel. Frisky and dashing, this wine is a good way to discover Burgundy and Pinot Noir. It will accompany braised veal, quasi of veal with cardamom gravy, roasted poultry, or pork cooked simply in meat juices. 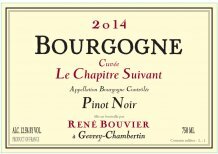 The Bourgogne Le Chaptire Suivant is a blend of different terroirs from the appellations Marsannay, Fixin, Gevrey-Chambertin, and Chambolle-Musigny. Traditional vinifaction lasting 20 days on average. Maturation in barrels and vats for 14 to 16 months. The bright, clear color of this red wine is a beautiful shining ruby. The first nose is of good intensity, as bright and elegant as the color. Cherry flavors dominate, and pulp gives way to kernel as the wine ages. After aeration, the nose becomes more complex, with spicy and floral notes that mingle harmoniously with the fruit. The attack is soft and tender. The assertive consistency gives great character to the wine. The tannins are mellow, and the texture becomes more velvety with time. The beautiful, very delicate retro-olfaction is characterised by fruity notes that behave with great elegance, in harmony with the saline finish. This wine is fully representative of the Côte de Nuits, it is a Bourgogne that rivals unashamedly with an Appellation Communale. Charcuterie, braised meat dishes, and regional cuisine marry perfectly with this wine. 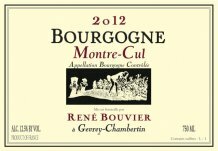 Grilled meats, especially beef, pair harmoniously with Bourgogne Montre-Cul. Best served at 17 ° C.
Traditional vinification lasts 20 days on average. Maturation happens in oak barrels for 18 months. Formerly one of the most beautiful lieux-dits in Dijon. Background: The Rabelaisian name of this place is supposed to be an ironic comment about the steep hillsides, which would have made it possible to see under the skirts of the women who worked there, without any effort. The Landscape: Located in the heart of the hillside vineyards, at the northern edge of the Côte de Nuits, to the west of the outskirts of Dijon, Montre-Cul ranges in altitude from 843 to 1007 feet, with an average of 892 ft. The slope is gentle to steep (2 to 13%), on average 5%, with eastern exposure. Subsoil and Soil: The Montre-Cul substratum is composed of two geological units. The lower, flatter eastern part of the plot consists of marls with sparse stones. The Comblanchien limestone, which lies above the vineyard, has a favorable effect on the soil of Montre-Cul. The former limestone cliffs, which faced due east, underwent extreme fragmentation during the last ice age 20,000 years ago, resulting in gravel chips measuring 1 -2 cm in size, which accumulated downslope. This limestone scree (called “grèzes litées” in Burgundy) generates an excellent soil for growing vines, with good drainage, like that of the Clos du Roy. The brilliant, clear color of this white wine is pale yellow tinged with green. The nose reveals typical fresh minty notes, mixed with white flowers (acacia), a delicate blend of depth and subtlety. The attack is full, with good viscosity. The terroir is rich in clay and marks the wines of the Clos with great minerality and a beautiful salinity. Truffle notes appear at the finish. It will be excellent as an aperitif, to liven up the taste buds. Parsley ham goes well with Le Clos. White fish such as sea-bass in gravy with Tonka beans, turbot, monkfish braised with orange sauce and sweet spices, but also seafood such as sautéed lobster and spring vegetables or scallops will suit this wine perfectly. It will also accompany semi- mature goat’s cheese, or poultry cooked at low temperatures and seasonal vegetables. 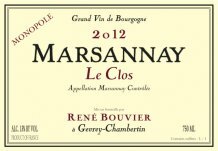 Best served at 12 to 14 ° C.
Grape Variety: Chardonnay Area of the estate producing Appellation Marsannay Le Clos: 7.4 acres (about 3 ha). The René Bouvier Estate, sole proprietor, therefore monopoly. 30-year-old vines. Two fermentations in barrels after pressing whole bunches of grapes. Maturation in barrels, with 30% new barrels, for 18 months. From 2008 onward, vinification in 600 L oak barrels. Background: The term “clos”, from the Latin “clauses” (closed) is frequently used in wine terminology. It refers to the limits of the plot, surrounded by a wall. The use of the article «le» (the) in the place-name indicates that the name was adopted after 1000 AD. The Landscape: Located in the heart of the hillside vineyards, just west of the village of Couchey, Le Clos ranges in altitude from 948 to 1076 ft, with an average of 994 ft. The slope is gentle in the east (2%), on average 4%, with eastern exposure. Subsoil and Soil: The Le Clos substratum is mainly composed of Crinoidal limestone. The clay and stone eroded from the hillside form a layer several tens of centimetres thick, which give the terroir its unique minerality. The color of this red wine is dense, a beautiful ruby. The nose is open, with cherry notes, and hints of white pepper. On the palate, the viscosity is very alert, very vibrant, and fresh tannins underscore the silky texture. This wine expresses the typical pure, fresh characteristics of Pinot Noir. Combined with the wine’s liveliness, its great minerality carries a touch of spices, and hints of garrigue. 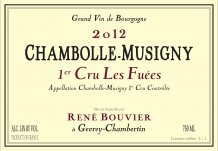 The frankness of this wine possesses the cherry character of the Premier Crus such as the Gevrey-Chambertin Petite Chapelle. With great elegance, great minerality and great persistence, this wine reveals an attractive salinity at the finish. It will go well with a salmis of guinea fowl and Lautrec garlic croutons, or a roast suckling pig and its soy-laced juices, a fillet of beef with a beetroot reduction, or duck breast with black currants. 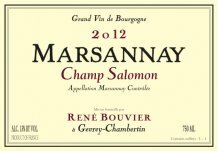 Best served at 17 ° C.
Area of the estate producing Appellation Marsannay Champ Salomon: 0.79 acres (0 ha 32 a). Maturation happens in barrels 30 % of which are new barrels, for 18 months. Background: The generic term “field” is used in association here to identify it more readily with the name of a person, Solomon, undoubtedly the owner at that time. Landscape: Located in the heart of the hillside vineyards, west of the D 974 road, Champ Salomon ranges in altitude from 928 to 1033 ft, with an average of 971 ft. The slope is very gentle (2%) at the bottom of the hill, and moderate (8%) at the top, with an average of 4%. Exposure is east south-east. Subsoil and Soil: The Champ Salomon substratum is composed of two geological units, separated by a fault. The higher western part consists of Crinoidal limestone, overlain by colluvial silts which generate a fairly dark soil, full of stones. The lower eastern part of the plot consists of marls, rich in small oysters (known as Ostrea acuminata), generating thicker, heavier soil. This red wine is a dense, violet color with ashes of purple. The nose is quite discrete, but complex, exploring the range of black fruit aromas with hints of flowers (iris, and violets). Spicy notes are well represented. The attack on the palate is elegant and ample. It is highly structured, powerful, with a beautiful consistency, similar to that of a Grand Cru. Liquorice aromas reflect the optimal maturity of the grapes. 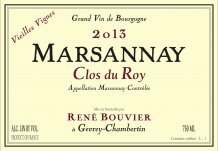 The volume and length in the mouth are extraordinary, supported by firm, ripe tannins, attesting to the longevity potential of the Clos du Roy. The consistency of the wine is expressed through its balance and superb viscosity. The notes of white pepper are dominant, with a fresh, saline finish. As the wine ages, the nose develops overtones of forest floor, while liquorice aromas persist. The palate reveals the spicy bouquet. Well-rounded structure of the wine, its density and salinity, backed up by its freshness and minerality, whatever the vintage, make up an exceptional wine. This wine is the perfect complement to red meat served rare, duck, pigeon, beef prepared simply, without too much sauce but rather a light, spicy gravy, veal kidneys with cumin and red onion gravy, and also venison or ostrich with a chocolate reduction, or beef tenderloin in a pastry crust with mushrooms and meat juices. Best served at 17 ° C.
Traditional vinification lasting 20 days on average. Maturation in barrels, with 30 % new barrels, for 18 months. Lieu-Dot has been renowned for centuries as one of the greatest terroirs of the Appellation Marsannay. Medium ruby color. The nose, dominant with raspberry notes, is open. The attack on the palate is ample and supple, supported by fine, ripe tannins that aren’t overwhelming. A touch of spice marks the finish. With great finesse and noticeable viscosity, this wine exploits its vivacity. The finish is highlighted by clear minerality. This airy wine has a good length. The name “En Ouzeloy” refers to a place planted with osier, an osierie. The En Ouzeloy plot consists of alluvial fan deposits of shale and gravel, which settled at the outlet of dry valleys (combes) north – west of the village of Marsannay-La Côte, generating an excellent growing vines, with good drainage. This wine will accompany beautifully red meats, grilled or in sauce. For other recipes, think: braised cheek of beef with candied carrots, pike with red wine gravy, red tuna with barely cooked Nori seaweed and soba noodles, in veal stock with ginger. Traditional vinification lasting 20 days on average. Maturation in barrels, with 30 % new barrels, for 18 months. The seductive, intense color of this red wine is enhanced by a beautiful flash of violet. The nose, intense, and slightly wild, becomes more complex when aerated, with floral notes of clove. The palate is ample, characterised by a beautiful mineral presence. Although the tannins are over-firm in the young wine, they mellow with age. The liveliness and length on the palate are accompanied by red fruit notes in retro-olfaction. This wine, with more texture than consistency, has a frank minerality that refreshes the palate with a pleasantly saline finish. It will go well with cooked meats such as sliced beef with black mushrooms and soy reduction, a side of beef and its juices with grape must, a filet mignon of pork with sweet and sour sauce, or a haunch of venison. Best served at 17 ° C.
Maturation occurs in barrels 30 % of which are new barrels, for 18 months. Background: The name «Crais» refers to the stony nature of the soil. It comes from a pre-Indo-European root «kar» meaning «stone», and reflects the abundance of stones in the soil of the plot. 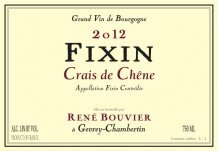 Landscape: Located in the heart of the hillside vineyards, north of the village of Fixin, Crais de Chêne ranges in altitude from 925 to 968 ft, with an average of 942 ft. The slope is gentle, on average 3%, with south-eastern exposure. Subsoil and Soil: The Crais de Chêne substratum is composed of two geological units. In the north-western part of the plot, there are marls, which generate heavier, less well-drained soil. The remainder of the plot consists of alluvial fan deposits of shale and gravel covering the marls, spreading from the outlet of the dry valley (combe) north of the hamlet of Fixey. These deposits generate an excellent soil for growing vines, with good drainage. This red wine is a deep ruby with subtle hints of purple, shining clear, bright and strong. The elegant nose unfolds with ripe black fruit and floral hints of violet, and a delicate touch of spices crowning the whole. The attack is supple and velvety, with a rich consistency, always lively and alert, and a pleasing viscosity. 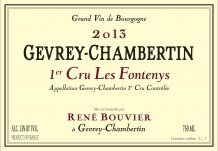 This elegant wine reflects the fine expression of the Gevrey-Chambertin appellation. It will go well with roast duck, grilled red meat, sea bream with tomato confit and Espelette pepper, roast black Bigorre pig, or Jabugo ham. Best served at 17 ° C.
Background: In the Middle Ages, the lord rendered justice on his lands. The place-name recalls the site where criminals were executed. In Old French, «Justice» referred to the gallows, or gibbet, the site of legal executions. 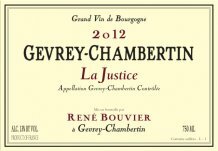 Landscape: Located east of the D 974 road, La Justice extends north of the village of Gevrey-Chambertin, a vast, almost flat vineyard, ranging in altitude from 807 to 860 ft, with an average of 830 ft. The slope is very gentle (1 to 2%), on average 1.5%, with eastern exposure. Subsoil and Soil: The anomalous situation, for Côte de Nuits, of an Appellation Communale east of the D 974 road is explained by its geology. During the last Ice Age, twenty thousand years ago, the excavation of valleys by raging summer torrents generated alluvial deposits, ranging in size from fine clay loam to blocks weighing several tons, at the outlet of these dry valleys (combes). The huge size of Combe Lavaut explains the volume of the alluvial fan deposits. These alluvial fan deposits of shale and gravel cover the marls and generate an excellent soil for growing vines, with good drainage. This red wine has a very clear, beautiful color. The nose is a complex aromatic palette of black fruit, combining fruity, floral and spicy notes. The consistency on the palate is associated with a velvet texture and a beautiful viscosity. The liveliness of this wine sets off its consistency. It is a classic, sensual Gevrey. Violet and liquorice appear in retro-olfaction, followed by a hint of white pepper, which highlights the complexity. All these elements underline its place in the family of great Gevrey wines. It will go well with beef in all modes, game, civets, a braised veal chop, calf liver and cumin gravy, or a capon stuffed with mushrooms and foie gras, served with the meat juices. 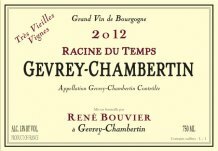 Best served at 17 ° C.
Area of the estate producing Appellation Gevrey-Chambertin Village Racines du Temps 2.47 acres, i.e. 1 ha The Racine du Temps (“Root of Time”) wine blends grapes from several very old vines, from the lieux-dits Les Créots and Pince-Vin, Appellation Gevrey-Chambertin Village Very old vines, eighty years old Traditional vinification lasting 20 days on average Maturation in barrels, with 50 % new barrels, for 18 months The name of the wine evokes the venerable age of the vines, with deep roots which draw all that is best from the soil and bedrock to express the terroirs of Gevrey-Chambertin. Such deep roots protect the plant from the vagaries of the weather (drought, cold, excessive moisture), thus guaranteeing a constant and vivid expression of the terroir, by means of the viscosity, consistency, and extraordinary length on the palate of this wine. Landscape: Located in the heart of the hillside vineyards, south of the village of Brochon, Les Créots ranges in altitude from 971 to 889 feet (296 to 274 metres), with an average of 919 metres. The slope is moderate, on average 6%, with exposure south south-east, protected from cold north winds by the Château of Brochon. Subsoil and Soil: The Racine du Temps wine comes from two distinct geological units. The Créots substratum consists of Comblanchien limestone, covered with a relatively thick layer of soil. In the north-western corner of the plot, alluvial fan deposits of shale and gravel cover the limestone. The Pince Vin substratum is more marly, and consists of Oligocene deposits. Adjacent to the Grands Crus, the Premier Cru Les Fontenys owns its beautiful bright ruby color and elegance that are necessary from the first nose and are confirmed by the delicacy of touch of mouth. The aromas are engaged with intensity and complexity with cherry and strawberry evocations… More in its velvety texture than consistency, it is a generous wine, very fleshy. Never harsh tannins. Finesse, silky texture and length are the archetypes of the Premiers Crus of the hillside south of Gevrey! It will go well with a deer fillet with fresh cranberries, fruits and autumn vegetables, with cromesquis chestnuts but also character cheeses. Forty-five-year-old vines. Organically farmed vines. Traditional vinification lasting 20 days on average. Maturation in barrels, with 20 to 30 % new barrels, for 18 months. A more elegant if not more complex nose presents notes of kirsch, red cherry, pomegranate and a hint of spice. The refinement continues onto the punchy and medium weight flavors that exude a subtle minerality on the balanced and lingering finale. It will go well with a saddle of hare a la creme, roasted veal in a crust, a terrine of hare or chicken. Best served at 17 ° C.
More than sixty-year-old vines. Organically farmed vines. Traditional vinification lasting 20 days on average. Maturation in barrels, with 20 % new barrels, for 18 months. Located to the south of Les Bonnes Mares, Les Fuées own their vigorous consistency and their elegant texture. Nevertheless, the vividness is more obvious, making it a very salivating wine, with delicate cherry touch on the finish. It will go well with monkfish cooked in the oven, yellow zucchini with cumin, roast pigeon and truffle mashed potatoes, stuffed eggplant, or a Brillat-Savarin for cheese. Fifty-year-old vines. Organically farmed vines. Traditional vinification lasting 20 days on average. Maturation in barrels, with 20 % new barrels, for 18 months. This red wine is very colorful, with beautiful shades of blue or purple when young. The consistency, fleshy roundness, and length rivalling that of a Chambertin are all to be appreciated. The elegance develops, the structure is clearly perceptible, with subtle viscosity, and an exquisite vivacity that brightens this wonderfully textured Grand Cru! The great elegance and finesse are sustained by dense tannins. As the wine ages, the bouquet develops with beautiful accents of violet, liquorice, vanilla, coffee beans, and even quince. The texture is exquisite, velvety and dense, the palatability of the finish is marked, and the aromatic persistence impresses by its intensity. Serving Suggestions: It will go well with seven-hour lamb, beef tournedos Rossini, lacquered pork with a wok of vegetables, a duck confit and Sarladaise potatoes or Epoisses cheese. 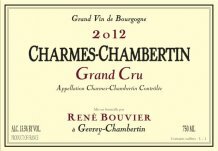 Best served at 17 ° C.
Area producing Appellation Charmes-Chambertin Grand Cru: 0.74 acre, i.e. 0 ha 30 a 60-year-old vines Organically farmed vines Traditional vinification lasting 20 days on average Maturation in barrels, with 50 % new barrels, for 18 months Background: The name Charmes comes from the pre-Latin word «calma». During the Middle Ages, this Latin root evolved into the parallel forms “chaume” (thatch), “charme” (hornbeam) and “chaux” (quick-lime). 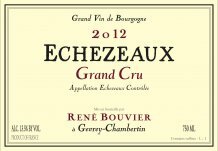 It is difficult to say whether the name of the Grand Cru comes from the tree or the dry calcareous grasslands. Landscape: Located in the heart of the hillside vineyards, just east of the Burgundy Wine Route (Route des Grands Crus), south of the village of Gevrey-Chambertin, Charmes-Chambertin ranges in altitude from 860 to 932 ft, with an average of 889 ft. The slope is gentle, on average 4%, with eastern exposure. Subsoil and Soil: The Charmes substratum is limestone. The higher, western part consists of Crinoidal limestone. The lower, eastern part consists of Comblanchien limestone. In the southern part, alluvial fan deposits of shale and gravel cover the limestone. The moderately thick soil contains both stones and silt. The bright ruby color of this wine marks the time of its youth, with beautiful violet hues on the edge of the glass. The attack is tonic and supple in a same movement, the consistency remarkable, the texture is fleshy and tight. The finish reveals complex aromas where the evocations of black fruits, sweet spices and a delicate touch of violet at the first nose come together harmoniously. Sweetness and minerality blend into this Grand Cru, seductive from its youth, but always ageing harmoniously and gracefully. It will marry perfectly with mallard sweet and sour gravy, and its mashed pumpkin with gingerbread accompanied with chestnuts, beef tournedos or a roasted chicken with chanterelles. Sixty-year-old vines. Organically farmed vines. Traditional vinification lasting 20 days on average. Maturation in barrels, with 20 to 30 % new barrels, for 18 months.